Ron Wroblewski addresses colleagues at a previous press conference. GALLIPOLIS — Vietnam Veterans of America, Tri-State Chapter 949 recently announced that Chapter President Ron Wrobelewski has been asked to speak at the National POW and MIA Recognition Day ceremony in Gallipolis. National POW and MIA Recognition Day is observed on the third Friday in September each year. It honors those who were prisoners of war and those who are still missing in action. The ceremony will take place at 11 a.m.. at Gallipolis City Park on Friday, September 21. Ron was born in Charleston, W.Va, graduated from Gallia Academy High School and is a Vietnam combat veteran having served as a field radio operator with the United States Marine Corps from mid 1963 to late 1966 (Vietnam 1965-1966). He says his service connected disability hasn’t diminished his love for America or his desire to continue to give back to his country. VVA members say his accomplishments are many. He has been named WSAZ TV’s Hometown Hero. Some may say his most significant and most recent is his successful project was getting a U.S. Naval ship named in honor of Hershel “Woody” Williams, West Virginia’s only living Medal of Honor recipient. VVA members say it took 18 years of dedication to get the Navy to name the ship. Ron is currently serving as the President of Tri-State Chapter 949, Vietnam Veterans of America and the West Virginia Marine Corps Coordinating Council. 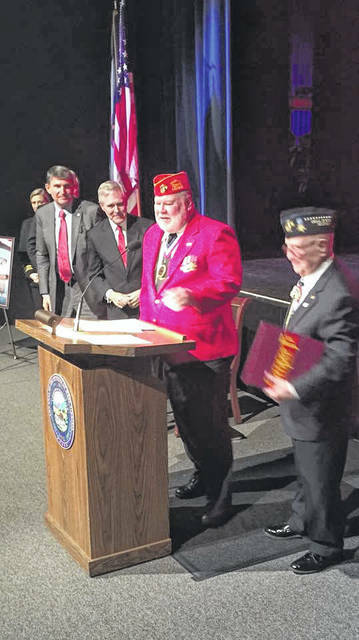 He is Past General Chairman of the Veterans Committee for Civic Improvement in Huntington, two-time Past Commander of VFW Post 1064, three-time Past Commandant of Huntington Detachment 340, Marine Corps League and an organizer of many events in Huntington and Charleston. Ron is active in the veterans’ community of the tri-state area.